Water and Electric meters are read monthly. Utility bills include monthly charges for electric, water, sewer, garbage, landfill, and storm water utility. Bills are sent out the 1st week of each month and payment is due by the 26th day of the month. There is a penalty charged for late payments. You may sign up to have your checking account or savings account automatically debited for payment of your utility bill. A deposit of $200.00 is required for new service, unless the customer is an owner of the property. There will be a $30.42 one time hookup fee added to your first bill. The City of Aurelia has available for purchase an outside water meter to be used solely for residential purpose i.e. watering lawns, gardens, filling pools, etc. The meter is hooked to your outside faucet with a hose attachment and records the amount of water used that does not enter the sanitary sewer. Cost to purchase meter is $95 and you are refunded once a year at $.05 per cubic foot of water usage recorded on the meter. Garbage Rates: $22.16 per month, landfill only $12.66. Water Loss Protection: $1.30 per month. $6.50 per month. Call for details. Residents of Aurelia receive electricity from Aurelia Municipal Electric. The utility purchases power from Northwest Iowa Power Cooperative (NIPCO) and Western Area Power Administration (WAPA). 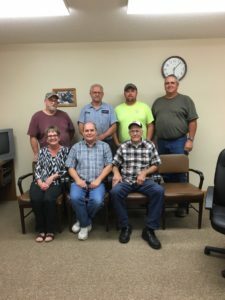 Aurelia also belongs to Western Iowa Municipal Electric Cooperative Association (WIMECA) which is a cooperative that includes the cities of Anthon, Aurelia, Hinton, Mapleton, Manning and Onawa. The electric is governed by a Board of Trustees. The current board members are Roger Redig; Craig Ballantyne; Marvin Krause; Bob Phipps; Dave Johnson. Aurelia Municipal participates in NIPCO’s rebate programs for electric heat and electric water heaters. There are generous rebates available for home owners to install electric heat sources and electric water heaters. There are also reduced rates available for the kilowatts used for electric heat and electric water heaters.